"She not only kicked doors open, she put a doorstop in the door and told others behind her to go through. Her mentorship was legendary," said Katherine Sharp Landdeck, a history professor at Texas Women's University who studied under Mariner at the University of Tennessee. Rosemary Mariner in the 1990s, when she was commanding officer of a Naval squadron in California. (CNN)The first woman to fly a tactical fighter jet in the US Navy opened the door for more than just women in combat. She also helped them with the transition to civilian life. 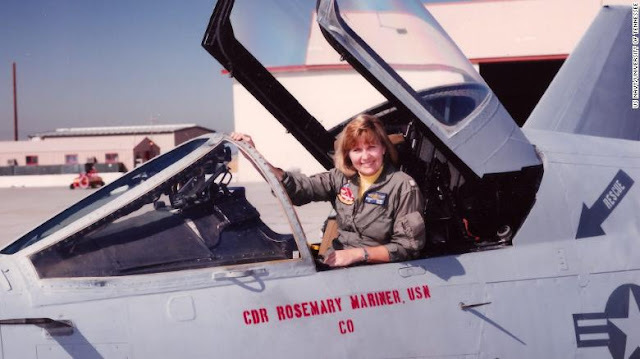 Now, at her funeral, retired Navy Captain Rosemary Mariner will receive the first-ever all-female flyover. The special tribute, officially (and datedly) named the "Missing Man Flyover," honors aviators who have died serving their country. It features four jets flying above a funeral service in formation before one of the aircraft peels away and climbs into the sky. Mariner died January 24 after a long battle with ovarian cancer. She was 65. Mariner was the Navy's first female jet pilot and the "first female military aviator to achieve command of an operational air squadron," according to a Navy statement.